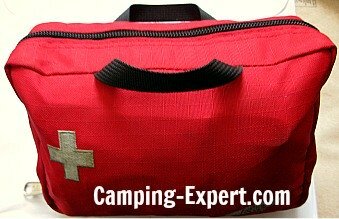 A Camping first aid kit / backpacking first aid kit is VERY important when traveling into the woods away from civilization, hospitals and emergency medical care. When you’re backpacking, the only thing you have is what you brought with you. So, make sure to have a full and complete first aid kit. This list should help. When making your own backpacking first aid kit , you do not need large bottles of everything, so bring enough for small emergencies, because if it’s serious you will be heading to a hospital quickly. 3. Triangular Bandages – used for slings, tourniquets, to tie splints. 5. A waterproofed sheet of important emergency contact phone numbers. 6. Extra medications – Tums, Ibuprofen, Acetaminophen, Gravol (anti-nausea), anti-diarrhea, Benadryl (anti histamine). 11. Splints - metal mesh, foam covering metal (SAM splint), or wood. 27. Space blanket- made of reflective plastic. There are two ways to acquire a camping first aid kit . A. Purchase a pre-made backpacking first aid kit meant for camping. B. Or purchase a first aid bag, and stock it yourself from your first aid supplies from home and purchase the missing items. Remember, you do not need large bottles of anything. Just enough to get you and your group to get out of the wilderness safely.